For years experts have been telling Americans what to eat and what not to eat. Fat, they told us, was the enemy. Then it was salt, then sugar, then cholesterol... and on it goes.Americans listened and they lost -- but not their excess fat. What they lost was their health and waistlines. Americans are the fattest people on earth... and why? Mainly because of the food they eat.In this scientific and revolutionary book, based on Nobel Prize-winning research, medical visionary and former Massachusetts Institute of Technology researcher Dr. Barry Sears makes peak physical and mental performance, as well as permanent fat loss, simple for you to understand and achieve.With lists of good and bad carbohydrates, easy-to-follow food blocks and delicious recipes, The Zone provides all you need to begin your journey toward permanent fat loss, great health and all-round peak performance. In balance, your body will not only burn fat, but you'll fight heart disease, diabetes, PMS, chronic fatigue, depression and cancer, as well as alleviate the painful symptoms of diseases such as multiple sclerosis and HIV.This Zone state of exceptional health is well-known to champion athletes. Your own journey toward it can begin with your next meal. You will no longer think of food as merely an item of pleasure or a means to appease hunger. 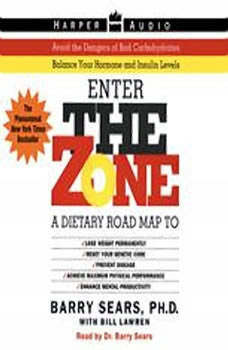 Food is your medicine and your ticket to that state of ultimate body balance, strength and great health: the Zone.